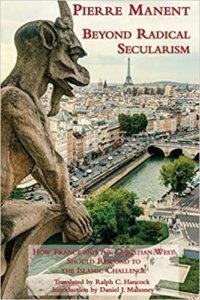 Beyond Radical Secularism: How France and the Christian West Should Respond to the Islamic Challenge. Pierre Manent. South Bend, IN: St. Augustine’s Press, 2016. I have sometimes deplored the liberties that C. K. Scott Moncrieff took in translating Marcel Proust’s sub-titles from À la recherche du temps perdu: how could À l’ombre des jeunes filles en fleurs (In the shadow of young girls in flower) possibly be translated as Within a Budding Grove, or Sodome et Gomorrhe as Cities of the Plain? But Moncrieff had nothing on the English publisher of Pierre Manent’s latest work, who has published what had been entitled, in French, Situation de la France, with the remarkably longer English title you see above, sharing only the word “France” with the original. And Manent never, at least in the translation outside of the title, uses the term “radical secularism.” But, no doubt, a book with the English title The Situation of France would not sell nearly as many copies in the Anglosphere as has the actual version with its much more provocative title. On the occasions when secular liberals are even able to admit that France might have a “Muslim problem,” a typical solution recommended is that France’s Muslims must “Westernize.” But Manent dismisses this as a fantasy: the “modern Westerner” into which Muslims are advised to transform themselves is itself only an abstraction, and not a concrete identity by which anyone could actually shape his life. And many Muslims show no inclination to achieve the status of the spiritually empty, cosmopolitan modern consumer: they seem to actually prefer to be part a community grounded in shared moral precepts. Furthermore, as Manent points out, this request is hardly fair to Muslim immigrants who were not told, when they came to France, that they would have to surrender their way of life as part of their relocation. Manent’s solution to the problem posed by the Muslim community existing inside the French nation, stated quite generally, is that first of all the French must reacquaint themselves with their own existence as a national community, something of which they have been busy denying the reality. Then the French nation can come to recognize the existence of another community within its borders, one characterized by a different way of life. At that point, the true nature of the problem to be addressed comes into view: the question is how these two communities can establish friendly relations, so as to permit them to coexist peacefully within a single nation-state. A proposal like this will no doubt drive many secular liberals up the wall, since it runs counter to so many of their principles. (Manent boasts early in his work that “what I have to say has something to please, and especially to displease, all parties” [p. 9].) It does, however, have the advantage that it might actually work. Manent concludes that it is only by revitalizing our common, civic life, a revitalization which will require renewed borders, that the West can hope to deal with the challenge of Islam “on the move,” in a way that is beneficial to the West and to the many Muslims seeking to live in the West. Eugene Callahan is an Associate Editor of VoegelinView, a research fellow at the Collingwood Centre at Cardiff University, and a Lecturer in Economics at St. Joseph’s College in Brooklyn. He is author of Economics for Real People (2004); Oakeshott on Rome and America (2012); and co-editor, with Lee Trepanier, of Tradition v. Rationalism: Voegelin, Oakeshott, Hayek, and Others (Lexington Books, 2018).